The recovery and reuse of nutrients (RRN) from various waste streams is a major focus area of the ambitious EU Circular Economy Package. In a circular economy approach, recovered materials are injected back into the economy as “secondary raw materials” that can be traded and shipped just like primary raw materials. Recent studies on major organic nutrient waste flows in the EU suggest that the scope for RRN is substantial. However, large-scale RRN ventures based on nutrient waste streams that are typically highly diverse, bulky, very diluted and geographically-dispersed pose major logistic, technical, HESQ (health, environment, safety and quality) and economic challenges. Positive business cases are therefore still scarce. One evocative case is the recovery of nitrogen (N) by VEAS, a large integrated municipal waste water treatment plant (WWTP; 650,000 P.E.) in Oslo, in cooperation with Yara, a mineral fertilizers and industrial / environmental solutions company. 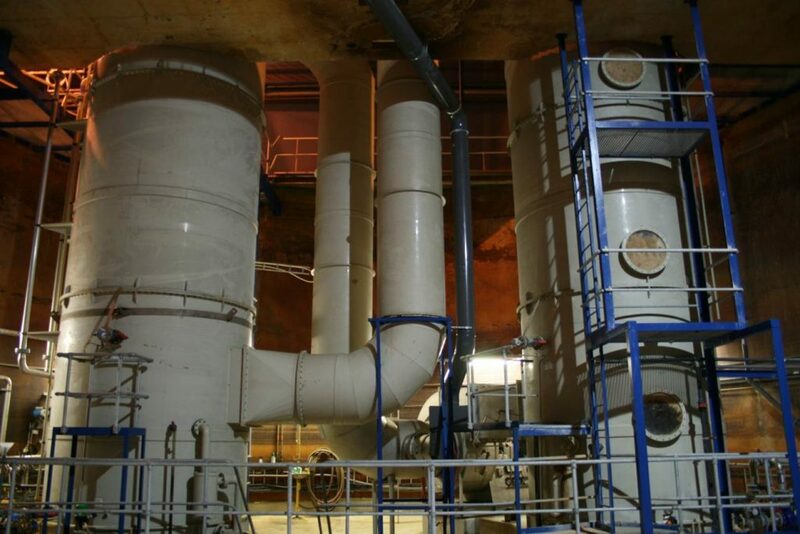 A substantial fraction (12-15%) of the total N load entering the VEAS plant is recovered – after anaerobic digestion (AD) of sludge, lime conditioning and filter pressing stages – via ammonia stripping and subsequent capturing (scrubbing) of the ammonia gas (NH3) with a concentrated nitric acid solution (HNO3 – 62% w/w). This stripping and scrubbing treatment yields an industrially reusable ammonium nitrate (AN – NH4NO3) side stream. Yara acts as a key-enabler in this circular business model through supplying the nitric acid and receiving the AN side-stream. 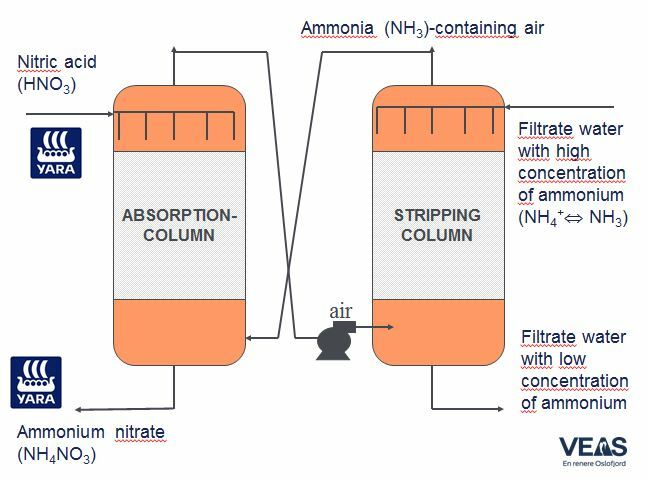 Ammonia (air)stripping represents a feasible and cost-efficient solution to remove ammoniacal N (NH4+) from the AD-filtrate water of a municipal WWTP. Some 350 – 500 Mt of N / year is recovered from the waste water, yielding a concentrated (54% w/w) AN solution of some 4,000 Mt / year. The required installations are compact and can easily be expanded (doubled) if the water treatment capacity would require further expansion. With Yara collecting the AN solution and managing all logistics, VEAS benefits from a safe, efficient and hassle-free solution, allowing it to focus on its core business (water cleaning). This novel business model generates meaningful new nitric acid sales. Depending on the market conditions, Yara can either sell the recovered AN-solution (without need for any further treatment) to selected industrial AN customers, or recycle it into its Porsgrunn fertilizer plant (located some 130 km away from the VEAS plant). The production of (partially) renewable ammonium nitrate. Significant infrastructural investments are required (stripping and scrubbing installations; nitric acid and ammonium nitrate storage tanks). Nitric acid and ammonium nitrate solutions require safe handling procedures managed by professional operators. The recovered AN solution has to meet strict industrial quality and safety standards regarding metal-, chloride (Cl)- and total organic carbon (TOC) contaminants. Occasionally, batches do not meet the Cl and TOC standards. The WWTP is sufficiently large (in order to have a meaningful recoverable N fraction). The WWTP plant is located in close vicinity of a nitrogen fertilizer plant.